Patrick Guadagno was most recently the President and COO of Versace US. Previously, he served as Managing Director of Dolce & Gabbana USA, where he led the transition of licensee status into an in-house corporate. Mr. Guadagno stays current on fashion industry news and market projections. In early June 2012, the Boston Consulting Group (BCG) released its predictions for luxury market growth through the next two years. The firm expects a worldwide increase of 7 percent each year if the economic climate remains relatively stable. Should the gross domestic products of major developed nations falter, the company predicts a more moderate rise of 3 percent per year. Several luxury retailers, such as Saks Inc. and Tiffany & Co., have reduced projections for the current year to temper Wall Street’s expectations. Nevertheless, high-end consumers continue to spend on luxury experiences, such as spa treatments, hotel stays, and adventure travel. Brands such as LVMH, which recently launched an upscale, five-star hotel franchise, stand to benefit from this growth in the “experiential luxury” sector, which BCG predicted would increase by as much as 12 percent annually for the next few years. Posted by patrickguadagno on June 29, 2013 in Fashion, Luxury Sales and tagged Boston Consulting Group, Dolce & Gabbana, Fashion, Growth in Luxury Sales, LVMH, Patrick Guadagno, Saks, Tiffany & Co., Versace. Patrick Guadagno has built a successful career in the fashion industry. Most recently, he led Versace US as President and Chief Operating Officer. 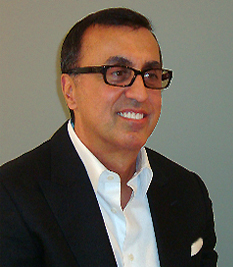 Mr. Guadagno has also served in leadership positions for Ittierre/IT USA, Calvin Klein, and Yves St. Laurent Menswear. He is particularly interested in developments at the intersection of fashion and social media. Bergdorf Goodman and Badgley Mischka recently collaborated to promote the designer label’s 2013 resort collection via Pinterest, a visually oriented website that allows users to “pin” images of items they like to their “pinboards.” The retailer’s team pinned previews of the collection in the days leading up to the fashion show, and live-pinned photographs of the new styles during the event. Fans responded favorably: the Pinterest board dedicated to the collection garnered 164 likes, 200 repins, and 21,000 followers after just 10 pins. A social media manager for Bergdorf Goodman explained that Pinterest was chosen to preview the collection because, unlike Twitter, it is an image-based social network, and the photos can be displayed there permanently. Other fashion designers who have utilized Pinterest include Oscar de la Renta, whose staff live-pinned dresses from his recent bridal collection show on the site. Posted by patrickguadagno on June 28, 2012 in Uncategorized. Despite the economic downturn of the past few years, sales of luxury goods remain strong. The trend bodes well for iconic brands such as Tag Heuer, Jimmy Choo, and Alexander McQueen, a few of the labels that posted robust sales in 2010 and 2011. Now more than ever, manufacturers of luxury goods are looking toward India and China as particularly profitable markets due to the rising number of affluent households in these countries. A January 2012 article published online by The Economic Times referenced a particularly telling report released by AT Kearney and CII. According to this study, robust spending on luxury non-essentials is growing by 20 percent annually and is expected to reach nearly $15 billion by 2015. Likewise, a Business Insider piece released in October 2011 pointed out that Asia accounted for approximately half of all international luxury sales last year, as “the Chinese probably spend more on luxury than Americans and Europeans combined.” Regardless of which market industry watchers choose to focus on, the fact remains that items of unsurpassed quality produced and distributed on a fairly limited basis will always hold great appeal for a number of retail consumers. Possessing extensive experience as a fashion industry executive and brand strategist, Patrick Guadagno has applied his knowledge and skills to facilitate the success of numerous leading global brands, including Versace, Calvin Klein, and Giorgio Armani. Posted by patrickguadagno on June 21, 2012 in Uncategorized and tagged Patrick Guadagno. Familiar with the world of fashion and the factors that affect the marketing and branding of luxury goods, Patrick Guadagno recently completed a term with Versace USA, where he led the organization as President and Chief Operating Officer. Throughout his 25-year career, Mr. Guadagno has paid special attention to the cost of source materials in the fashion industry, including cotton. Cotton futures recently fell to their lowest level in nearly three years, with July futures at 66.10 cents per pound, according to the Financial Times. A year earlier, the commodity had reached a high of $2.27 per pound. Experts attribute the decline to India and China’s slowing economies, as well as rain in Texas, which produces extensive amounts of cotton. In addition, the Ivory Coast, a major cotton producer, expects to export 31 percent more cotton this year as it begins to recover from a 10-year political crisis. With price declines, some experts fear contracts may not hold. Last year, buyers who promised to purchase cotton at record highs balked at delivery times because the prices had declined so greatly in the meantime. Between March and November, the fiber’s per-pound cost fell by 60 percent. Industry analysts expect that retailers will soon start to see higher profits on cotton goods. Low prices may eventually be passed on to the consumer for mass-market brands. Posted by patrickguadagno on June 15, 2012 in Uncategorized and tagged Cotton Prices, Fashion, Fashion-Executive, Fashion-Marketing, Patrick Guadagno, Patrick-Michael-Guadagno, Retailers. A leader in the fashion industry, Patrick Guadagno served as the President and Chief Operating Officer of Versace US and the Managing Director of Dolce & Gabbana USA. Patrick Guadagno has experience in every aspect of the fashion industry. Here he explains the basics of a career in fashion marketing. Fashion marketing combines design, advertising, and image with a strong interest in the fashion world. People who specialize in this type of marketing take a new line of clothing and bring it to the interest of the industry, exposing the brand in getting the attention it needs to be successful in the highly competitive market place. Fashion marketers ask questions about a new line, including who is most likely to purchase it, in what combinations it will be most successful, and how it will appeal to various market segments. Marketers stay connected with the latest styles and trends in various age groups, popular culture, and high fashion in order to better serve their clients by helping them target their work to the best audience. Fashion marketers work behind the scenes in the industry, tracking consumer buying patterns, trends, and advertising technologies. As specialists in advertising, they aide designers and manufacturers to create a compelling advertising message surrounding each collection, often designing marketing materials and choosing where to deploy them for the greatest impact. They work to connect designers directly to the consumer, conveying their products to those who want to engage in them. Posted by patrickguadagno on June 4, 2012 in Uncategorized and tagged Fashion, Fashion marketers, Fashion-Marketing, marketing, Patrick Guadagno. The economic recession led to drastically decreased sales for retailers, but perhaps none were affected as much as stores and designers that catered to men. In recent years, men have largely curbed spending on clothing and accessories, causing sales of men’s apparel to drop at double the rate of sales of women’s apparel. Today, as retailers such as Macy’s and Saks Fifth Avenue have reported increased earnings after the 2011 holiday season, a new trend has emerged among shoppers. Retailers are reporting growing sales in accessories, most notably in men’s accessories such as bags, umbrellas, and jewelry. In 2011, sales in men’s apparel and accessories surpassed sales for women, growing by 8%. Inspired by the unprecedented trend, designers are rebranding and redesigning traditional women’s accessories to attract male consumers. Designers note that bracelets in particular are popular among men, adding that the subdued pieces, many made out of leather or metal, can add a touch of elegance to a man’s look both inside and outside of the workplace. The shift in men’s clothing sales may also point to a brighter economic future in that men are taking careful consideration of how they present themselves. Many see this concern as a clear indication that men who have been affected by job losses are moving back into the workforce and wish to maintain a more polished and professional appearance. The former President and COO of Versace, brand strategist Patrick Guadagno also held leadership roles with Dolce & Gabbana, Calvin Klein, Giorgio Armani, and Yves St. Laurent. Posted by patrickguadagno on May 29, 2012 in Uncategorized and tagged COO, Economy, Executive, Fashion, Growth in Sales, Men's Accessories, Patrick Guadagno, Retailers, Versace. The following article was originally published in DNR on December 12, 2005. New York – After a notable absence from U.S. retail, Versace’s men’s runway collection is back, and its newly organized American division is spearheading a push to reestablish all of its brand’s collections by taking direct control of their distribution. On Dec. 1, close to 85 percent of Donatella Versace’s South Beach-inspired spring collection arrived in select Saks Fifth Avenue and Neiman Marcus stores. The collection, chock-full of Versace signature printed silk shirts cut in a slimmer, more mode4rn fit, marked the return of the men’s collection to the designer floors of U.S. department stores after a decade. Saks bought the Versace Collection for its Bal Harbour, Fla and Manhattan stores, while Neiman Marcus si selling it in Las Vegas, San Francisco and Beverly Hills. Both retailers will feature a look from the collection in their spring catalogs. The small victory for Versace, which is undergoing a major restructuring aimed to return the company to break-even by 2007, is just the first step in a multi-layered plan to rebuild the men’s business in the U.S.
Guadagno, who started with the company in May, jointly oversees the Versace business in the U.S. with Roberto Lorenzini, president of Versace’s retail division. Before their respective arrivals, Versace managed the U.S. market from its headquarters in Milan. At its height, Versace men’s represented close to 55 percent of the company’s total business. Following the death of Gianni Versace, the collection systematically faded from the U.S. and shrunk overall. Today, men’s represents less than 40 percent of worldwide sales, according to Versace CEO Giancarlo Di Risio. Guadagno declined to give a percentage for men’s U.S., but it’s reported to be far less than that. “Men’s is a fresh canvas, and to turn it around we need to start from the top” Guadagno said. And while the runway collection is important for brand recognition, he believes Versace Collection is where the bulk of sales will come from for Versace’s men’s business. Versace Collection, launched for fall 2005, replaced the now-defunct Versace Classic line; however, the secondary line failed to make a mark in the U.S. “Up until now, [Versace Collection’s] product offering had not been right for the U.S. market,” said Guadagno. To remedy the situation, the fashion veteran immediately went to work to resolve fit and styling issues. He then insisted that Versace Collection, manufactured by Veze, a joint venture between Versace and Ermenegildo Zegna, be produced entirely in Italy rather than in scattered countries as previously done. The redesigned tailored clothing collection, which retailers start previewing this week, is more consistent in terms of quality and fit. Suits, cut slightly slimmer, start at $995 retail and cap out at $1,595. Guadagno said the real emphasis would be in the $1,095 to $1295 range. New to the fall/winter 2006/2007 offering is a complete line of woven shirts, which will retail between $175 and $295, and sport coats, $695 to $895. Guadagno said his first-season target for Versace Collection is between 40 and 60 doors, both specialty department stores. He would like to reach 200 doors in the next three years. The final prong in Versace’s new wholesale strategy is to take control of U.S. distribution of Versace Jeans Couture starting with the fall 2006 collection. Until Dec. 1 it had been distributed by its licensee, IT Holding. The Italian manufacturer will continue to produce the diffusion line and distribute in all markets outside the U.S.
Guadagno guided a similar project while at Dolce & Gabbana where he oversaw the transition of marketing and sales of its D&G label from IT Holding to its own showroom. Versace’s other diffusion line, Versus, is also in a transition period. As reported, Versace said it would not renew its Versus license with IT Holding when it expires in January. Di Risio said the company would present a strategy for the secondary line in February or March. Versace is on track to break even by 2007. Earlier this year it said it should narrow its losses to 15 million euros, or $18.5 million, in 2005, while sales are expected to drop 6.3 percent to 300 million euros, or $369 million. Posted by patrickguadagno on November 8, 2011 in Uncategorized.